Remember Tito, Yugoslavia’s most famous leader? Does that name ring a bell? Maybe you’ve only heard of him or perhaps you’re someone who’s familiar with his political career and accomplishments. Tito’s life was a rags-to-riches story, as he started as a boy in a tiny village and grew to become one of the most successful politicians of his time. When you look at him, all you probably see is a proud, dignified man, but we decided to take a look beneath the covers. Let us tell the story about the man who was deeply loved and respected by all of Yugoslavia. Tito’s life didn’t have a fairy tale-like beginning. He didn’t come from a wealthy or aristocratic family. Josip Broz was born in 1892 to Franjo and Marija Broz. Like most families in that era, his was quite large, as he was one of eight children. Even though he was born in Kumrovec, a small village in northern Croatia, he spent a great deal of his childhood with his maternal grandparents in Podsreda, Slovenia. Which answers the question people have been asking for years now – why does Tito have such a strange foreign accent when he was born in Croatia? In spite of the fact that he grew up to be an ambitious leader, when he first started school, he wasn’t very successful. It’s hard to believe, but Broz actually failed the second grade and then gave up on school completely after the fourth grade. Some stories, although never confirmed, even say he was bad at spelling his entire life. Were you independent at the age of 15? Well, Tito sure was! A couple of years after dropping out of school, he left his village, went to Sisak (a town in Croatia) and became a locksmith’s apprentice. He didn’t ask for his parents’ money – on the contrary, he paid for his work clothing himself. Tito was no stranger to other jobs as well. During his youth, he repaired bicycles, worked in factories and in a restaurant. After completing his apprenticeship, he started moving throughout Europe every couple of years and switching jobs constantly. Actually, at the time of his moves, he participated in various labor protests and strikes. His first contact with social issues was when he joined a union of metallurgy workers. At that time, around the age of 18, he became increasingly interested in politics. He read the socialist newspaper and got informed about the movement. Eventually, he joined the Social-Democratic Party (which later changed the name to Communist Party). Fortunately for him, his persistence proved to be very important in his political career, since he rose to the very top of the Communist Party fairly quickly. It’s hard to imagine risking your freedom or life for a political party. However, in the beginning-of-20th-century Yugoslavia, it was not that far from reality. The communist youth in the then monarchy, including Tito, were often subject to arrest and persecution. He managed to bounce back from that and, after getting out of prison, became secretary-general of the CPY. Also, he started working with the Comintern – a international Communist organization. But, why did people call him Tito, when his name was Josip Broz? Tito was not his birth name or a nickname given to him by friends. Well, after he was released from prison, he took the name Tito as his pseudonym, for doing underground Party work. It was something many Communists had to do at the time, to hide their real identities. His, unlike many others’ names, stuck. He truly stood out from everyone else during World War II, when he led the Partisans – the Communist anti-Nazi movement. He won people over by not only being charming, but also a trustworthy fighter for freedom. From that point on, his reign was pretty much secured. As a result of his fight, people started to believe in him and were thankful for everything he has shown in the most difficult times. He was elected prime minister right after World War II and the first thing he did was transform Yugoslavia from a monarchy to a republic. The Communists made sure they got payback for the years of oppression and, while doing that, arguably even went overboard. Some accused Tito of being a dictator, while others thought of his leadership as a benevolent dictatorship (absolute power, but for the benefit of the population). However it may be described, the people of Yugoslavia truly loved him and loved their country immensely. The vast majority enjoyed the fact that they lived under a more liberal type of communism, often called “Titoism”. This meant they had more freedom than the inhabitants of other communist countries. Tito even had the bravery to stand up to Stalin’s criticizing Yugoslavia for being independent from mainstream communism. This temporarily isolated Tito and the country from the Soviet Union and the Comintern. His iconic quote shows just how confident he was. However, other than that conflict, he pretty much managed to keep a balance between the East and the West throughout his career. Broz tried to not to choose a side, but still be on good terms with everyone and essentially do what’s best for Yugoslavia. This tactic got its’ embodiment in the Non-Aligned Movement, which he founded along with a couple other leaders. Tito was reelected as president several times. Eventually, he secured his place in office literally until the day he died. The new constitution, adopted in 1963, proclaimed him the president for life. He ruled until 1980. If you’re curious about Tito’s personal life, you won’t be disappointed. It’s almost as exciting as his public, professional one. Turns out he wasn’t only known for his political career, but for his relationships as well. He was married three times and had four children with two of his wives. However, perhaps the most intriguing relationship he had was not one of his marriages. Instead, it was the movie-like love with Davorjanka Paunović, his personal secretary who lived under the code-name Zdenka. She was a young girl who some say was the love of his life. Their relationship was secret and exciting, full of passion, but it ended in a terrible tragedy. She died of tuberculosis at only 25. Tito was so heartbroken by this that he insisted that she be buried in the backyard of his Belgrade residence. But the woman everyone knew and remembered was Jovanka. She was, no surprise here, his secretary at first. He married the 30 years younger beauty in 1952 and made her the First lady of Yugoslavia. The Yugoslav Jackie Kennedy was the country’s sweetheart, loved by many and loyal to Tito through their rocky marriage. It definitely wasn’t easy being the wife of Yugoslavia’s leader, but Jovanka never fell from grace. Tito was a famous hedonist and was known for his lavish, luxurious lifestyle. The man knew what he liked and knew how to get it. He lived in an actual castle, used by presidents, and had a private home as well. The beautiful Brijuni Islands were the site of the State Summer Residence, where he and Jovanka spent most of their vacations. His property had a stunning villa and a garden which had a, believe it or not, private zoo. Also, there was another residence at Lake Bled and in one Karađorđevo as well. His collection also featured a yacht called Galeb (“Seagull”), a private jet and a train (The Blue Train). However, none of these were actually in his possession, but were public property to also be used by those after him. Living life like a true star, he loved spending time with other superstars, such as Elizabeth Taylor, Richard Burton, Sophia Loren and many more, which were all guests in his summer residence. When it comes to Broz’s relationship with religion, there is actually an anecdote about it. He was raised Roman Catholic and was even an altar boy at one point. One time, he struggled with helping the priest remove his vestments and got slapped and yelled at. It is said that was the day he decided to never enter a church again in his life. Still, whether the story is true or not, like most Communists, he was an atheist. Tito passed away on May 4th 1980, three days before his 88th birthday. Because he died in Ljubljana, his coffin was transported to Belgrade in his presidential train. If you ask people who were alive at the time, the sentence they all still remember is how the news began that day. Namely, after the TV screen went black for 30 seconds, the newsreader read – Comrade Tito has died. Another incredible proof of his worship is what happened that day on a certain soccer match. After his death was announced to the audience, the entire stadium of 50,000 people spontaneously started singing “Comrade Tito we swear to you, from your path we will never depart”. His fame and how much people valued him during his life all manifested themselves on the day of his funeral. Until Nelson Mandela’s funeral, his was the largest state funeral in the entire history, though it’s still considered to be one of the largest. On May 8th, representatives from both aligned and non-aligned countries came to Belgrade to pay their respects. To be precise, four kings, thirty-one presidents, six princes and twenty-two prime ministers came to the House of Flowers (his mausoleum). Among them were Margaret Thatcher, Prince Philip, Leonid Brezhnev, Saddam Hussein, Hosni Mubarak etc. President Jimmy Carter couldn’t be there, so he sent his mother to represent him and the United States. 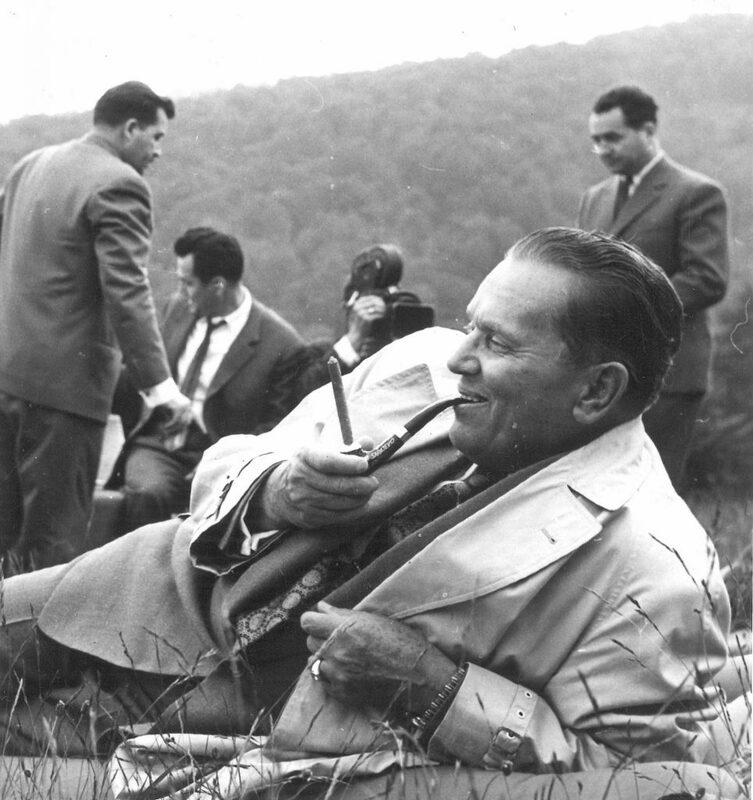 The story of Josip Broz Tito is still intriguing for the people of former Yugoslavia as well as the entire world. Some even have theories about him being a foreign spy, since his manners and habits resembled those of people who were raised in aristocratic families. Whatever the truth may be, no one can take away his iconic status, which will outlive all debates and arguments about his identity. Through many periods of turbulence, he managed to remain the symbol of prosperity and unity in Yugoslavia. The legend that his life is, will without a doubt continue to live on for a long time.